No tricky, cutesy write-ups for me. I just want the facts out there. I need a special home with no young children. I need to be loved and cuddled. I don’t need you to gloat about how handsome I am even though I am VERY good looking. I can see it now…..I’m the only dog, I can go with you everywhere in your oversized purse or on a leash. You’ll love me so much that you won’t want to leave me and I won’t want to leave you. Yup, I just want to be spoiled and I’ve actually earned it but I won’t ever take you for granted. Promise! In short, my foster mom reports that I am a super cuddle bug (nice for those chilly days). If you have a fireplace, you may find me laying in front of it. Feel free to join me. If I could be on your bed at night with a blanket that would be awesome and I take up so little space you’d never know I was there. Most of the time I am very calm and laid back but if you give me a toy, I’ll come alive. Oh, and I love carrots and treats. How long has it been since you’ve met a dog that likes carrots? I will walk on leash with you but I if there’s something unusual or spooky, please reassure me that you’ll protect me. Hey, how about if you and I found a doggie obedience class to attend together??? That would help build my confidence level and let you know how to remain the in-charge human. Hmmmm - I like that idea. What do you think? I bet I could excel and we’d be at the top of the class. There’s other information from my former owner so if you’re interested, just use the link to ask. I’ll be loyal to you. Count on that. Isn’t Penny gorgeous? She has such incredible markings on her face and body and what lovely hair she has, too. Penny is a pretty easy little girl to have around. She is fun and attentive. She loves to go in the car and walks are super fun for her. The mix in her makes her a little smaller than a Papillon which is kind of nice for lifting and fitting into cozy spaces. Penny lived with a young woman who loved her with all of her heart but became ill and could no longer care for herself let alone Penny. She did the best thing she could for her best friend and put her into Rescue where we could take care of her while looking for her forever and ever home. We have her now and we just love her to pieces. Gads can she run fast on those little legs. We are working on teaching her to fetch so she has something to run towards. But she could run towards YOU just as readily. Sadie has had quite a journey so far in her young life. We are astonished at how sweet, loving, trusting, and gentle she is. We KNOW that she’s part Schnauzer but you have to see her up close to catch the resemblance. On first glance she appears to be a scruffy sort of Jack Russell Terrier with a Lhasa overshot jaw. What she IS…is absolutely dear. 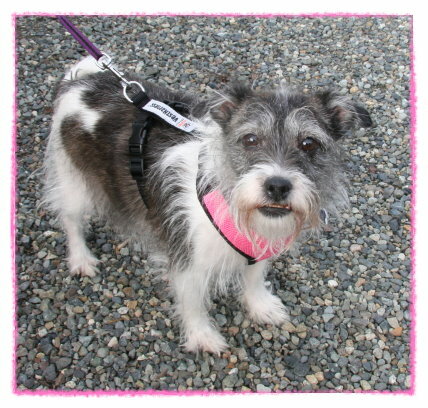 She needed a home ASAP and she was fortunate that the” Schnauzer Foster Home” was available. When she arrived, she met all of the resident Schnauzers and thought she was amongst her own. Sadie was the only one with an actual tail but it was wagging along with the little cropped stumps of the other dogs. Sadie, unfortunately, has been living in isolation from human or canine compassion and affection. She is looking for a home in which she will have possibly both but definitely needs to be with a person or two who will love and cherish her and never ever want to give her up. She has been moved around due to human’s poor choices in their own lives and she has been the victim of these poor choices. She deserves better and is going to get the best. Sadie is healthy, has been potty trained but since she has been living in a house where the human ignored her, we think a recent Poo on the rug inside the doggy door was a definite cry for help. She has been desperate for love and attention. Through everything she is just wonderful. She wants to be a best friend, loves walks, loves to play, and wants someone that SHE can love back. We want a home for her in which she will feel settled and centered because her owner has his or her life together. We really love that she has the qualities of all of these breeds and that together they tone down any negative characteristics of any one particular breed. It may seem a little crazy but it sure works for her. Sadie has excellent car manners, quiet house manners, and when her adoring eyes catch yours, your heart will melt. Heart? Melt? Just in time for Valentine’s Day! 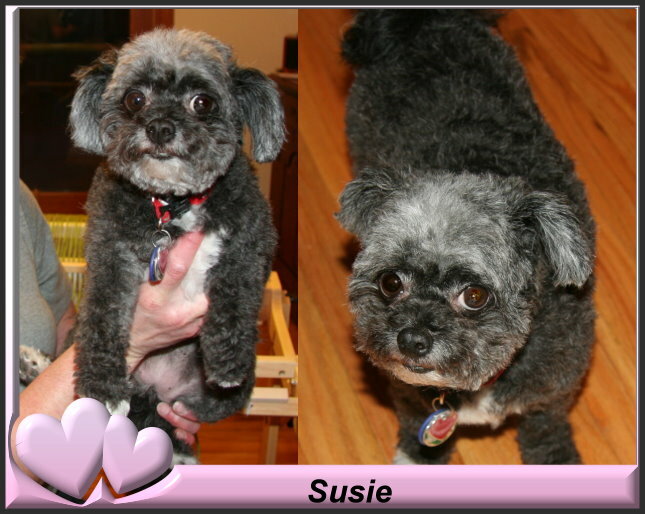 Little Susie has come such a long way during her short tenure in her foster home. She is comfortable, happy, funny, sunny, and very silly and loving. She is also potty trained!!! Now she loves going outside for “potty” and for walks though she doesn’t seem to think pottying on a leash is necessary. We have not seen a poo in the house for many weeks and she only uses her pee pad if left unattended for a long period of time. Susie has become more comfortable with intrusions and noises and the barking has dropped considerably. Normally when dogs and people from upstairs head down the stairs, that’s when she barks. It’s wonderful to see her going outside with the other dogs and actually enjoying being out of doors investigating nature and checking on the other dogs’ activities. Her foster home feels that she has shaken off her most recent life of living with a person with Alzheimer’s and has gotten back to the dog she surely must have been before her owner took ill.
We love this little cuddly bug. Hi everyone. How have you been liking this rain lately? I wanted to check in with everyone on FB and give you an update on how I’ve been doing. Susie got adopted yesterday and though we had become good friends and I was sorry to see her go, my foster mom can see that I am not the barky dog she thought I was. I do bark when I want you to know I need something but that’s it. I kept trying to tell her it was Susie’s influence. I keep everyone laughing with my antics as they call them. It’s true, though, I DO have a twinkle in my eye. I have settled in very nicely and have made friends with some dogs and let’s just call it a “military alliance” with one of the bossy dogs. I am getting the hang of potty outside but I still use a pee pad in my bedroom. I know a lot of people don’t like this but it’s all I knew and it seems very tidy to me. Still, I am learning to go outside and let my foster mom know when I would like to go outside. I come with a lot of veterinary records from my recent check up and exam so I’m pretty lucky to be so healthy. Some of the people who worked so hard to keep me out of the shelter have been checking in on me and want to come for a visit. It’s always nice to know that someone loves you. Now I just need someone to love me who wants to give me a home. I keep hoping. 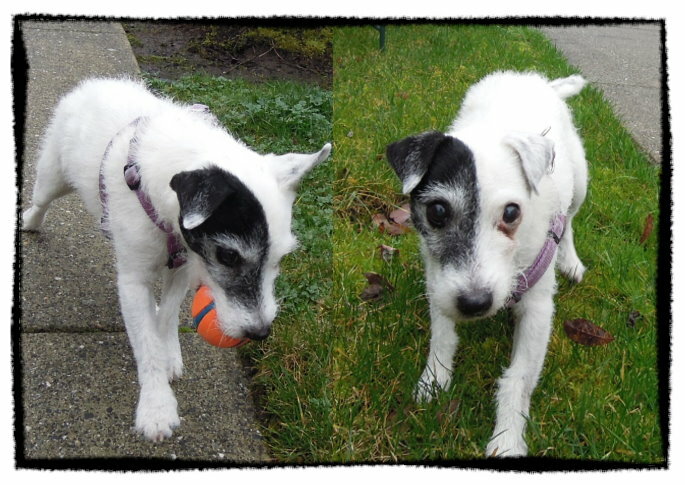 Zoe is an adorable, sweet, playful 13 year old purebred Jack Russell Terrier. Her owner went into assisted living and sadly had to give up her dog. previous disc injury, but it doesn't slow her down much, and it's not at all painful. Otherwise she is very healthy. She is current on all vaccines,microchipped, and just had bloodwork and dental. She like to have her teeth brushed. Zoe would be best as an only dog, although she may get along with a dog that doesn't challenge her. She is great with cats. She would be fine with children over 8 years old. She would really love a home with a fenced yard so she can run around and be a terrier. And yes, she really is that cute! 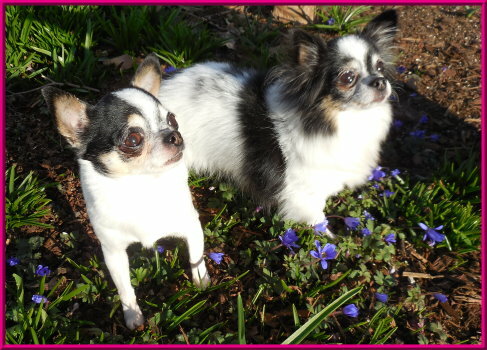 Lolly and Dot came to Furbaby Rescue due to the death of their owner. 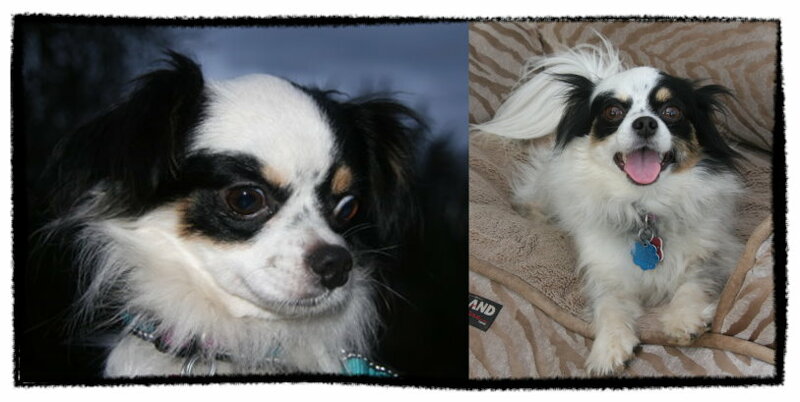 Both dogs have been together since Dot’s birth and are a bonded pair. They have been cared for very well. We are looking to adopt them together. Both dogs are in good health, with recent dental cleaning done while in our care. They are both extremely social dogs and adore people. They get along well with other small dogs. They can live happily with cats, although chasing them, on the rare occasion, is a fun game. Both came to us a few months ago, but only recently have we put them up for adoption. Lolly, the mamma, came to us with a broken foot. She has had a cast for a few months but now with everything healed both dogs are ready for their new, forever home. Both dogs are quiet little snuggle bunnies. Both are potty trained to a wee pads, love to take walks, but like many little dogs are barky to big dogs they see on walks, but easily redirected with treats. Lolly would be happy to snuggle with you all day and get belly rubs for all eternity, Dot is happy to do the same with a game here or there of fetch, with her favorite toys. They happily sleep in their beds at night, enjoys chewies and treats for good behavior. In their foster home, they live with other small dogs and cats. They are a joy to care for and will be missed greatly. A good home for them would be someone who wants two quiet, relaxed dogs who like walkies a few times a week and snuggles everyday. Sweet, sweet Pretzel is a most delightful girl! She loves to snuggle under the covers like most Dachshunds, loves to have a good chew on a raw bone, is gentle with her kisses, gets along well with other dogs, and she'll be turning 9 y/o in May though you'd never guess it. She's up-to-date on vaccines, microchipped, full dental, bloodwork, all ready for a new home. She loves her green beans with breakfast. Her previous owner passed away and she needs another retired home to love and love her. She'll do best in a somewhat quiet setting and devote herself to kind loving people. I sure hope someone adds the music “My bags are packed and I’m ready to go…” to this write up because I am ready to move on in life. I have my carry bag, a booster seat, a raincoat and a fleece coat all packed. No kidding!!!! My human mom just passed away and while I miss her terribly I know she’s feeling better where she is now. She made me promise to go on with life and live it for her so that’s the plan but I may need your help. Please, please, please, don’t give a second thought to my age. I’m healthy per my recent vet check up and I had my teeth cleaned so my breath is fresh and ready to meet you nose to nose. 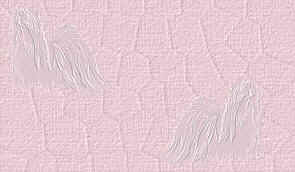 I am called a Phantom poodle, and I am beautiful I think I look pretty awesome don’t you? The consensus is I am very gorgeous and honestly, I think so, too. Since I’ve been in the foster home, I have had to deal with being left at home while people go to work. I would be thrilled to be back in a home where someone was home most of the day because I love having my special human home but if you do have to go out for awhile I’ll make sure you know you are super loved and appreciated when you return home. I’m very smart and I don’t brag….well, not much. I learned how to use the doggy door at my foster home the very first day I was left at home. That deserves an “A”, don’t you think? I’ve also been classified as a perfect addition for a quiet family. I love going on walks and I’m even capable of leading the little group of dogs in my foster home. I’m a good eater, not at all picky, and I don’t need any particularly special food although it is wise to still provide me a good quality food. That’s why I’m in such good physical condition now. I’m friendly when I meet new people and I don’t mind meeting children but remember that Furbaby Rescue has a policy regarding small children in an adoptive home so if you have some, be sure to talk it over with foster mom. If you have any further questions about why I’d be the perfect addition for your life, just click on the link and ask my foster mom. Yeah, I know Benji isn’t all that unique for a dog’s name but trust me, I am very unique. Or at least my life’s story is so unique you’ll think I’m making it all up. I can guarantee you it’s all true and there are police reports to prove it. NO, NO, NO!!! I didn’t do anything bad to get into trouble with the police. Nope, the police cared about me so much that they saved me and got me to a safe haven called Furbaby Rescue. Ready to hear all about me? I was living with a homeless person….in a car. It was so bad that twice I was confiscated. The lady had an accident this last time so I was taken in for my own safety’s sake. That poor lady doesn’t have her car to live in anymore but I lucked out and now have this great foster home. There’s food, and warmth, and toys, and loving and treats. Man, oh man, what a life and I’m told it can only get better if someone adopts me forever. My foster parents can’t believe that I’m supposed to be 11 years old. Key words are “supposed to be”. I heard them talking and using the words alert, bright, inquisitive, smart, jumps high like a poodle, and has the silky coat of the Maltese. There’s nothing wrong with my hearing either because I truly did hear them describe me that way. In addition, I can be very animated. I like other dogs. I am house trained and will even bark to let you know it’s time to open that door to do my business or go for a walk. Oh, and I do get quite excited about going for a walk. I do well in a car. Go figure! I might whine for just a short time if you crate me in the car but I’ll settle down quickly or you could buy me one of those doggy car seats for our rides together. My eating habits are a bit different from many other dogs. I’m a small eater and not fussy because there was never much to eat in the way of actual dog food. So I do have a habit of begging for the human food but the really good news is, I can be trained to not beg for your food and eat the dog food which is so much better for me. Foster mom will have some tips for you on that. Good news flash!! All my medical has been done. My blood work up came back perfect. The vet said my teeth are amazing and I’ve only lost 2 teeth, which for my breed and the homeless circumstances is amazing. I love my foster dad and my foster mom so I’ll love my new forever parents regardless of your gender especially if you’d consider letting me sleep on your bed. Hint, hint, hint. There just can’t be any young children in the home per Furbaby Rescue’s adoption policy. Here's Lucy! A busy, busy girl if something needs tending to and she decides if the situation deserves a little barking or just a cuddle, once she settles into her new home. She can be a bit skittish if she's not sure of her new situation but settled in foster care in just a few days. She loves to sleep under the covers at night. She's 3 y/o, up-to-date on vaccines and just had a dental cleaning so she's ready for her next adventure with new owners. Lucy will do best where she can be the boss if there is another dog. She loves to ride in the car and does well in a booster seat so she can survey the world. No young children. 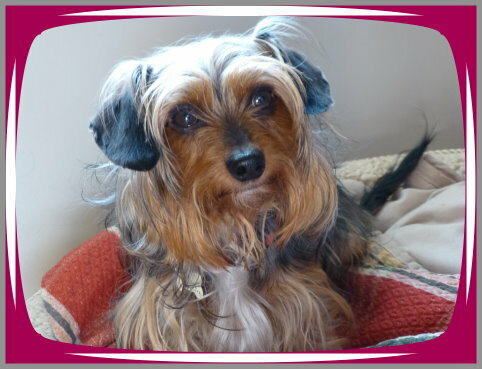 She is a true terrier at heart, and needs an owner who can give definite direction.